At 2pm on Wednesday 28th November, be prepared to be dazzled a wonderful festive show…Making their first appearance here are Neil Sands and his wonderful West End cast with the 2018 production of their hit Christmas show, bringing an unforgettable afternoon of festive nostalgia, taking us all back to a time when Christmas really was the most wonderful time of the year. Be transported back on a yuletide sleigh ride filled with of 60 all-time favourite Christmas songs and carols. Described as “A Sparkly Christmas Card Come To Life” with a shimmering stage set, beautiful Christmas trees, glittering fairy lights, and even falling snow. 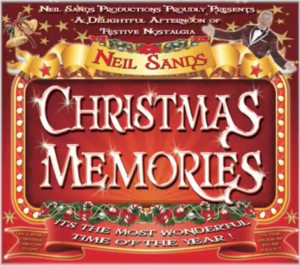 Mixed with over 40 stunning costumes, this is the perfect pre-Christmas treat, guaranteed to having you singing along from start to finish, bringing back many happy memories of Christmases past and warming your heart on the coldest winter’s day. Tickets are £12.00 for adults and just £10.00 for seniors to include tea and biscuits at the interval! Groups of ten or more receive the 11th ticket free!